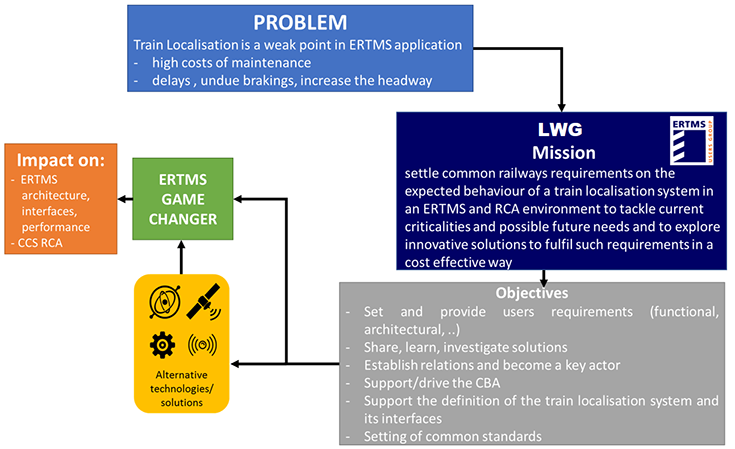 The mission of Localisation Working Group (LWG) is to settle common railways requirements on the expected behaviour of a train localisation system in an ERTMS and RCA environment to tackle current criticalities and possible future needs and to explore innovative solutions to fulfil such requirements in a cost effective way. To set and provide users’ requirements (functional, performance, architectural, interfaces) for the evolution of the train localisation system with regard to the ERTMS and RCA environment. To share, learn, secure experiences of members or other actors (e.g. suppliers) and support the members regarding train localisation projects to compare different technologies and solutions to fulfil the users’ requirements. To establish relationship with all actors involved in the topic (ERA, GSA, ESA, EC, UNISIG, CER, S2R, UIC …) to share and propose train localisation system users input. To become one of the key actors of the satellite positioning game changer. To support the possible CBA analysis that the sector may carry out on the introduction of new technologies for train localisation. To support the development of the train localisation system architecture and its interfaces based on innovative solutions. To support the setting of common standards (possible Change Request to ERTMS specification) and develop a legal framework.